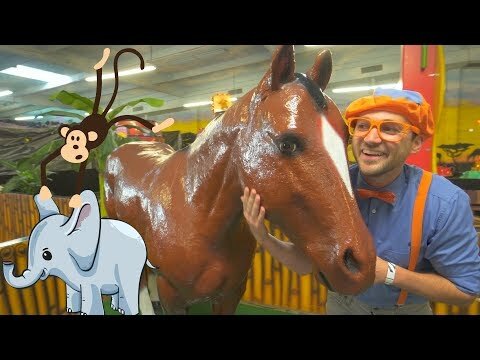 Blippi heads to the indoor playground to learn about jungle animals. This animal video for kids is a fun way for children and toddlers to learn with Blippi about jungle animals. Your child will learn with Blippi in this educational video for toddler about the animals Monkey, Elephant, Horse, Hippo, Zebra, and more! You can watch more Blippi videos and Blippi songs for toddlers at If your child likes animals and Blippi you can watch more videos like the Blippi Horse Video and other fun animal videos for children with Blippi in this full Blippi compilation playlist: Thanks for watching the Blippi Jungle Animal video for toddlers and his other educational videos for toddlers!